in SCBC Recruitment are 52 posts. Category wise vacancies are given in the notification. Age of the candidate applying for SCBC Haryana Recruitment should be between 18 years to 38 years. 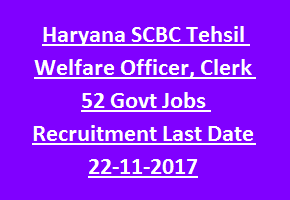 Interested candidates have to visit SCBC Haryana official website http://haryanascbc.gov.in/ and apply for Clerk, Tehsil Welfare Officer Jobs. Selection of candidates for SCBC Haryana Recruitment vacancies is based on their performance in written exam/ Interview. Last date for submission of SCBC Haryana applications with attested copies is within 15 days from the date of Advertisement date (22-11-2017). Full details regarding Welfare of Scheduled Castes & Backward Classes Department, Haryana SCBC Recruitment of Tehsil Welfare Officer, Clerk Jobs Eligible qualifications, Age limits, Pay Scale, Selection Method, Application Process are mentioned below. Last date for submission of SCBC applications: within 15 days from the date of Advertisement (22-11-2017). Total available vacancies in Welfare of Scheduled Castes & Backward Classes Department Haryana SCBC Recruitment are 52 posts. 1. Tehsil Welfare Officer: 25 posts. Total no of vacancies: 52 posts. See the SCBC Notification for category wise vacancies. Go through the SEBC Notification for Pay scale details. Applicant should attain minimum age limit of 18 years and maximum age limit of 38 years. Age relaxations admissible as per Haryana Govt Rules. Tehsil Welfare Officer: Graduation with Economics/ Sociology as one of the subject or Master’s in Social Work (M.S.W) from recognized University. Clerk: Must have passed 10+2 with Hindi/ Sanskrit upto Matric Standard. Preference will be given to the candidates with Computer Knowledge. Selection of candidates for Haryana SCBC Recruitment vacancies is based on their performance in written exam/ Interview. Interested candidates fulfilling eligible criteria have to go through the official website of Welfare of Scheduled Castes & Backward Classes Department @ http://haryanascbc.gov.in/. Go through the instructions available in official website to fill the application. Last date to send application form is within 15 days from the date of publication of SCBC Advertisement.